Ban has come and gone, but his shade lingers like a long shadow over a slow tropical sunset. There was no drama this time, with the likes of protesting demagogues on a pathetic hunger strike conspicuously missing in action – unlike the last-time the UN Secretary General visited Sri Lanka in 2009, in the aftermath of our civil war’s conclusion. Where Wimal Weerawansa, that great post-war agent provocateur, was, in the first week of September this year, is anyone’s guess – and why he absented himself from the spotlight of the world-stage an academic issue to those who are willing to let bygones be bygones and has-beens be absent without leave. 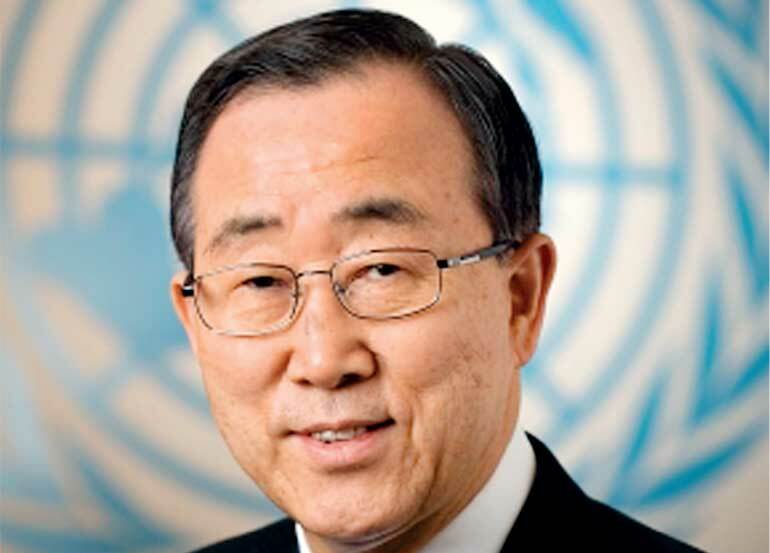 With that said, to essay the suggestion that the reason for MR’s UN- and UNSG-thumping acolyte being MIA in 2016 is that cometh the hour, cometh a new hero – a subtler, more suave, politically sophisticated internationalist like Mangala, say – is to suggest that Sri Lanka is more pleased these days to embrace post-conflict pacifist diplomats than angry not-so-young men masquerading as demagogues of any importance. It would be as dangerous to assume that the mere absence of MR to succour his acolyte with the refreshment of king-coconut water means that Ban Ki-Moon’s visit was as welcome as fresh nectar to an island-nation still licking its war-wounds, in some demographics, out of sight of the cosmetic-loving media spotlight. The conventional wisdom is that Sri Lanka’s leaders are getting their act together, this time round, and getting it right – at least as far as internationalism goes… and mending fractured relationships with the Western powers. The devil’s advocate, however, might have it such that all this pandering to UN personages – and kowtowing to the vested interests of the powerful UN-influencing nations that back UNSG Ban Ki-Moon – come at a cost… a cost which Sri Lanka today is not only willing to, but able to, pay: precisely because king-coconut water is not the flavour of the month any more, and champagne and caviar are on the menu. True enough, the ‘Kevum and Kokis and Kiribath only for us Lankans’ brigade is still active and alive – so much so that instead of a fainting (or feinting) Wimal on his back on a stage, the Joint Opposition staged an MR-driven foot-march for Ban’s benefit. Even if the timing of this and the indictment of Gotabaya Rajapaksa and others (as a coalition counter to showcase government’s determination to hound out the corrupt and the chauvinistic alike in one fell swoop) was happenstance, or coincidence, and not enemy action. This is to say that the politics of patriotism is in two minds today – to be or not to be supportive of the thrust towards ‘transitional justice’ being transplanted from overseas on home soil in an environment essentially hostile to truth and justice. To be or not to be – and what the question is, if our leaders can figure it out and frame it for popular consumption, can fuel their being regnant in politics and remnant in politics. On the one hand, there are those who uncritically welcome Ban’s appeal (among other noble sentiments expressed) to our youth of a lost generation. Reaching out as he did to them, reassuring them that rather than being “une génération perdue”, they are in fact the hope and pillar of Sri Lanka’s – and the world’s – future prospects for peace. This is a naïve response. For as much as it is normal for patriotism-thumping local yokels to tell their electorates that it is a sweet and fitting thing to die for one’s country (“dulce et decorum est pro patria mori” – the old lie), it is natural for internationalist politicians serving a noble cause such as showering our war-torn youth with hope to spew out platitudes that are no less true by dint of also serving a baser global agenda for peace-profiting elder statesmen. A few take a strategic tack, seeing in the UNSG’s visit and accompanying words the desire of our democratic-republicans at home and realpolitik-driven diplomats overseas to mend broken fences between the island and the global village, manage an amelioration process, outmanoeuvre rising regional interests inimical to ‘western’ civilisation based on ‘truth’ and ‘justice’. (If Bush and Blair are asked to give an account by the same international peacekeepers, perhaps some of our own cynics’ interest might be piqued. This is the view from within the republic. It is by no means representative of every perspective. There is a blue moon over many Sri Lankan shoulders – and heads and hearts and souls – that the press in particular ignores or the media including social media platforms neglects because they are not sunshine stories (or conversely dark enough in an appealing romantic sort of way like Kashmir; just sorry and tragic like the ruins of Kilinochchi). But perhaps it helps highlight the discomfiting but not incommodious truth that Sri Lankan society is badly bifurcated. About the nuts and bolts of how, whether, and if at all, our middle-income nation (with all the prestige but pitfalls that status brings) is to transform into a middle-of-the road democracy that is ostensibly being welcomed back into the global village (with all the perks and privileges that situation affords but perils it also entails). Ban has come and gone. Bands for and against his raison d’etre play on, Wimal or no Wimal, warts, and all. Be that as it may, Govt. (for Ban as UNSG and the UN as the spokesperson of the global village is playing it at government-to-globe level this time… as evinced by Ban’s ban, as it were, on meeting mere politicians as opposed to leaders representing the state), will have to play it more savvy. For one, transitional justice is one thing; truth and justice is another – especially as we are not a truth-guilt society where control is maintained through primarily a guilt lens; or, failing that, the criminal-legal system. For another – and this is probably one of the many reasons why the Darusman Report was popular with the indigenous, eastern-orientated, erstwhile regime; and equally reprehensible to western-looking, internationalist republicans – Sri Lanka is firmly ensconced in a shame-honour society. It is who we are and will be, transitional justice or otherwise. If justice, then, is to be done, it must filter into – and be made to fit, comfortably – the shame-honour receptacle in which we hold our future. A ban on guilt (desirable for post-war Sri Lankans) is not the same as a ban on truth (consummation devoutly to be wished for the post-conflict society we want to be). We can have our shame cake, but not eat it or be seen eating it (ergo, the hullabaloo over whether forces heroes will pay a price, etc.). Ban, an Easterner, might understand this apprehension. Hope his political masters hear the truth in not shaming a guilty society, too. A lot more than a diplomatic victory for politicos and statesmen and superpowers that be is riding on it.